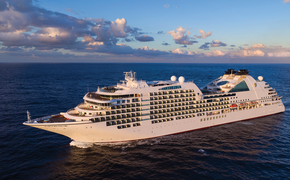 Regent Seven Seas Cruises is expanding its all-inclusive product by including free Wi-Fi for guests in higher-category suites beginning with winter 2014-15 sailings. Guests in Concierge-level and higher accommodations will receive up to 500 minutes of free Wi-Fi. Regent also will make a multimillion dollar investment to upgrade the onboard Internet system fleet-wide. The line will double the satellite bandwidth to improve the quality and speed, expand the Wi-Fi signal’s range so it’s available in all suites, public rooms and outdoor decks, and replace all onboard hardware such as the modems, routers and bandwidth compression equipment with advanced technology. The upgrades are scheduled to be completed by year’s end. The 2014-15 winter program will be announced on Oct. 9. The number of free Internet minutes received will be based on the length of the voyage, and includes one log-in per suite that may be used on one device at a time. The log-in can be used on a variety of devices. There are 200 free minutes for one- to seven-night voyages, 300 or eight to 10 nights, 400 for 11 to 15 nights, and 500 for 16 nights and longer. Once onboard, guests in Concierge-level suites and higher can upgrade to an unlimited package at a discounted rate of $14.99 per day, which is half of the standard package rate of $29.99. When the minutes are used up, they can purchase additional Internet time for 99 cents per minute plus a one-time activation fee of $3.95 or $160 per 200-minute package plus a one-time activation fee of $3.95. Guests in Deluxe or Window Suites can purchase Wi-Fi onboard for 99 cents per minute, plus a one-time activation fee, of $3.95, $160 per 200-minute package, plus a the $3.95 activation fee or $29.99 per day for unlimited minutes with no activation fee. Guests in select Seven Seas, Society tiers are eligible to receive free unlimited Wi-Fi Internet access.